UPDATE: here are backstage photos of Sarah, the auction winner, and her husband Greg! “Greg and I arrived at the show in full VIP treatment. 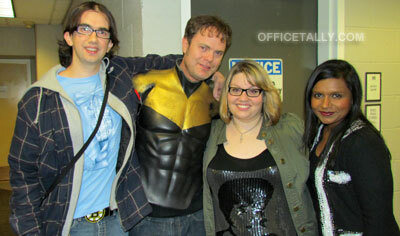 I was SUPER nervous to meet Rainn and Mindy (who wouldn’t be?). So I asked if I could see them before the show. Rainn was in full get-up for the opening number and hugged me immediately (he truly is a nice guy!). Mindy was so nice too (she smells really pretty!). 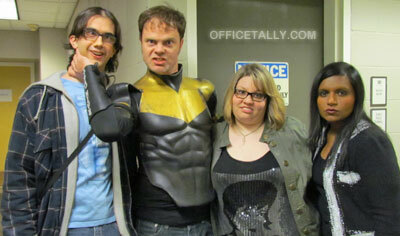 We took the standard celebrity and fan photo op, but when I asked for a silly face shot, he immediately went for Greg’s jugular (there is some Dwight in him at heart). The original auction details are on the next page. 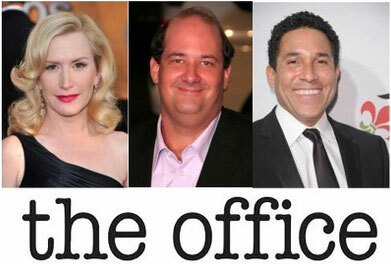 Charitybuzz is auctioning off a visit by The Office’s Rainn Wilson to your New York City office! Proceeds for this auction benefit Children’s Theater Company.